Today's So Shoe Me is the Chelsea Mid Bandana Flat by Pennant, $180, available at Solestruck. 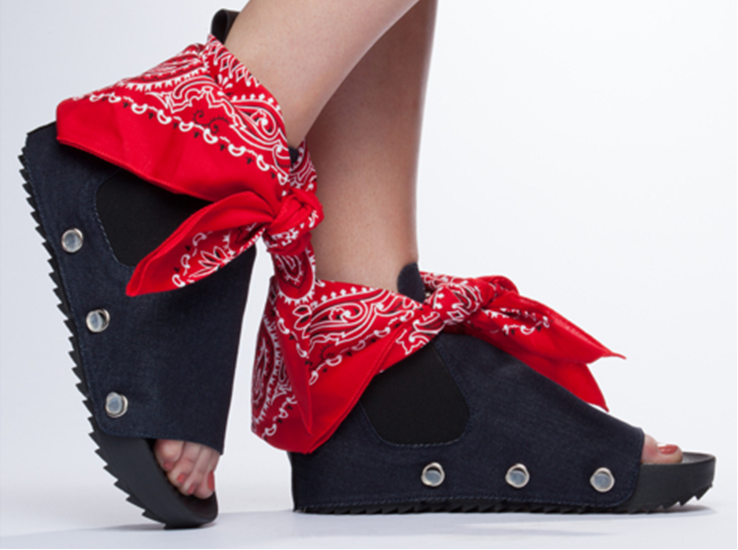 Step out in some rad rockabilly sandals with these interchangeable bandana and denim flats by street wear brand, Pennant. A novel idea that mixes trendy prints and patterns with interchangeable functionality, these click and switch sandals have a sturdy sole and upper that can be switched out to fit your style of the day. The bandana, upper and sole can be easily removed and cleaned so you won't have to worry about getting these babies dirty. With leather options and the ability to tie around your own favorite accessory (think scarfs, chains, etc.) these street ready sandals are truly unique to you. Pair these flats with a fringed suede bikini and floppy hat for a hippie chic look this festival season. So Shoe Me a pair of bandanna ties sandals that will add a rad rockabilly edge to my summertime style.